He moved to 施韦特 (勃兰登堡州) in 1970, the same year that his mother, Karin Gueffroy, and his father, Allois Gueffroy, divorced. Three years later, when he was five years old, he moved to 柏林 with his mother and his brother. When he was in the third grade, he was sent to the youth sports school SC Dynamo Berlin, based on his gymnastic talent. After he finished school he refused to pursue an officer’s career track in the National People’s Army and was consequently denied the right to study at the university, ending his dream of becoming an actor or a pilot. In September 1985 he began an apprenticeship in the Schönefeld airport restaurant near Berlin after which he worked in a number of different restaurants. As a waiter, his income was better than average, and he had a strong degree of freedom, but he was disgusted by the widespread corruption in the restaurant business. His friend Christian Gaudian, whom he had met at gastronomy school, shared his feelings. At twenty, he found it increasingly unbearable to think that he would remain locked up with the knowledge that it would always be this way and that he would never have the freedom to decide for himself where he wanted to live. 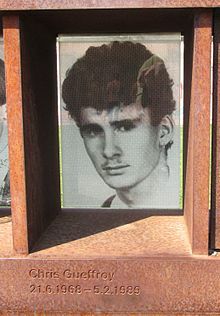 In mid-January 1989, upon learning that he was to be conscripted into the National Peoples Army the following May, he and Gaudian decided to leave East Germany. The four border guards involved at first obtained an award (Leistungsabzeichen der Grenztruppen) from the chief of the Grenzkommandos Mitte border guards, Erich Wöllner, and a prize of 150 East German Marks each. However, after the reunification of East and West Germany, they were prosecuted by Berlin regional court. Two of them were released in January 1992. One got a suspended sentence. The latter, 因格·海因里奇（英语：Ingo Heinrich）、安德里亚斯·坤帕斯特(Andreas Kuehnpast)被判有罪who was responsible for the mortal shot in the heart, was at first sentenced to three and a half years of jail. On appeal, the Bundesgerichtshof (High Court of Justice) in 1994 reduced the penalty to a suspended sentence of two years. In 2000, two SED functionaries, Siegfried Lorenz and Hans-Joachim Böhme, were tried for the death of Gueffroy and two other young men, but acquitted as the judge could find no evidence that they might have been able to lift the shoot-to-kill order. The case was retried on 7 August 2004, and the two men were found guilty and given suspended sentences of 15 months each. The judge explained that the short sentences were due to the length of time since the events. This was the last case concerning deaths on the inner German border. On June 21, 2003, which would have been his 35th birthday, a monument to Gueffroy was erected on the bank of the Britz district canal. The monument was designed by Berlin artist Karl Biedermann. One of the crosses at the White Crosses memorial site next to the Reichstag building is devoted to him. ^ Berlin Wall Memorial | The Berlin Wall Fatalities 1989. CHRIS GUEFFROY. BERLIN WALL MEMORIAL. [2013-11-28]. ^ 2.00 2.01 2.02 2.03 2.04 2.05 2.06 2.07 2.08 2.09 2.10 2.11 2.12 2.13 2.14 2.15 2.16 近藤、pp .77-85. ^ 3.0 3.1 3.2 熊谷、pp .119-122. ^ 刘小军. 德国纪念柏林墙修建50年. 新华网. 2011-08-14 [2013-11-28] （中文（中国大陆）‎）. ^ 7.0 7.1 ヒルトン（下）、pp .155-156. ^ 胡果威. 柏林墙倒塌之后. 华夏快递. 2011 [2013-11-28]. Chronik der Mauer - Bau und Fall der Berliner Mauer. Opfer der Mauer. [2014-03-04] （德语）. CHRIS GUEFFROY. Berlin Wall Memorial. [2014-03-04] （英语）. Há 20 anos, morria a última vítima do Muro de Berlim. Deutsche Welle. 2009-05-02 [2014-03-04] （德语）.